Introduction: Nurses are at risk of depression at a rate twice as high as other professionals. Depression in addition to individual effects also influence quality of work and organizational performance. Surveying the prevalence of depression in nurses will help policymakers make systematic plans in this regard. Because of the importance of this issue, the current systematic review and meta-analysis was conducted to determine the prevalence of depression among nurses in Iran. Methods: All published studies concerning the prevalence of depression among nurses in Iran during the 20-year period of 1997 to 2017 were extracted and studied using the Preferred Reporting Items for Systematic Reviews and Meta-Analyses (PRISMA) guidelines. Searches were conducted for articles using the keywords “Nurses”, “Depression”, and “Iran” in the local databases of SID, Iran Medex, and Mag Iran and in the international databases of PubMed, Science Direct, CINAHL, and Google Scholar. The extracted data was analyzed using STATA software, version 11, using the random effects model. Results: A total of 14 studies with 4062 participating nurses from different wards and hospitals were analyzed. The overall pooled estimate of depression prevalence among Iranian nurses was 26.88% (95% CI: 21.45%, 31.91%). Subgroup analysis showed that the estimated prevalence rates of depression among military nurses and public nurses were 22.38% (95% CI: 19.45%, 25.30%) and 28.12% (95% CI: 21.46%, 34.78%), respectively. Conclusions: The results of this meta-analysis revealed that the prevalence of depression among Iranian nurses was relatively high. Therefore, policymakers must pay more attention to planning and the prevention of depression in nurses. Lin HS, Probst JC, Hsu YC. Depression among female psychiatric nurses in southern Taiwan: main and moderating effects of job stress, coping behaviour and social support. J Clin Nurs. 2010;19(15- 16):2342-2354. doi:10.1111/j.1365-2702.2010.03216.x. Brandford AA, Reed DB. Depression in Registered Nurses: A State of the Science. Workplace Health Saf. 2016;64(10):488-511. doi:10.1177/2165079916653415. Centers for Disease Control and Prevention. Depression in the US household population, 2009-2012. National Center for Health Statistics, Division of Health Interview Statistics; 2014. https://www.cdc.gov/nchs/data/databriefs/db172.htm. Accessed 2018. Morrison-Valfre M. Foundations of Mental Health Care. Elsevier Health Sciences; 2016. Blackmore ER, Stansfeld SA, Weller I, Munce S, Zagorski BM, Stewart DE. Major depressive episodes and work stress: results from a national population survey. Am J Public Health. 2007;97(11):2088-2093. doi:10.2105/AJPH.2006.104406. Melchior M, Caspi A, Milne BJ, Danese A, Poulton R, Moffitt TE. Work stress precipitates depression and anxiety in young, working women and men. Psychol Med. 2007;37(8):1119-1129. doi:10.1017/S0033291707000414. Kassani A, Niazi M, Menati R, Alimohamadi Y, Menati W. Relationship between nurses’ depression and quality of life: applying path analysis model. Quarterly Journal of Nersing Management. 2014;3(2):61-69. [Persian]. Chen YM, Chen SH, Tsai CY, Lo LY. Role stress and job satisfaction for nurse specialists. J Adv Nurs. 2007;59(5):497-509. doi:10.1111/j.1365-2648.2007.04339.x. Nasl Saraji G, Dargahi H. Study of quality of work life (QWL). Iran J Public Health. 2006;35(4):8-14. Samadi S, Golmohammadi A, Seyedahmadian S, Rezapour T, Panahi H. The relationship between job stress and occupational empowerment of nurses in selected military hospitals of the country. Journal of Police Medicine. 2013;2(1):31-37. [Persian]. Taghva A, Yazdani A, Ebrahimi MR, Alizadeh K, Sakhabakhsh M. Prevalence of depression in psychiatric nurses and comparison with other parts of the AJA hospitals. Nurse and Physician within War. 2013;23(24):11-16. [Persian]. Kazemi Galougahi MH, Kouhian K. A study of depression prevalence of nurses and it’s effective factors in Tehran. Nurse and Physician Within War. 2010;14:8-11. [Persian]. Asad Zandi M, Sayari R, Ebadi A, Sanainasab H. Abundance of depression, anxiety and stress in militant Nurses. Journal of Military Medicine. 2011;13(2):103-108. [Persian]. Khalilzadeh R, Yavarian R, Khalkhali HR. The relationship of job stress, depression and anxiety of nursing staff of Urmia University of Medical Sciences. Journal of Urmia Nursing and Midwifery Faculty. 2005;3(1):10-17. [Persian]. Yasemi M, Peyman H, Khajavikhan J, et al. Prevalence of Depression among Nurses Working in the Operating Rooms and Intensive Care Units. Journal of Zabol University of Medical Sciences and Health Services. 2014;6(4):70-77. [Persian]. Khani H, Ghodsi H, Nezhadnik H, Teymori S, Ghodsi A. Depression and its relationship with hypochondriasis in nurses in Neyshabur, Iran. Military Caring Sciences. 2016;3(1):34-40. doi:10.18869/ acadpub.mcs.3.1.34. [Persian]. Alipoor R, Ebrahimi A, Omidi R, Hedayati A, Ranjbar H, Hosseinpour S. Depression, anxiety, stress and related demographic variables in nurses of Valiasr hospital in Fasa University of Medical Sciences in 2014. Pajouhan Scientific Journal. 2015;13(4):51-59. [Persian]. Khajehnasiri F. A study of depression prevalence of nurses and its effective factors in Tehran Emam Khomeini Hospital. 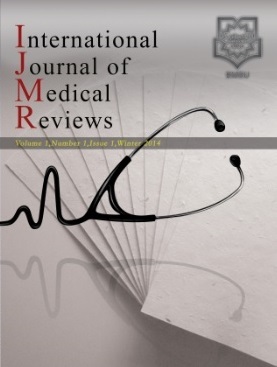 Tehran University Medical Journal. 2000;58(1):10-14. [Persian]. Mahmoudi S, Zehni K. The comparison of depression prevalence between shift work nurses in education hospitals of Kurdistan medical sciences university. Iranian Journal of Nursing Research. 2013;8(1):29-38. [Persian]. Dehghani M, Zoladl M, Boland-Parvaz S, Keshtkaran Z, Mahmoudi R, Jabbarnejad A. Asurvey on depression and its related factors in Nurses who work in Namazi Hospital of Shiraz University of Medical Sciences-2008. Iran Occupational Health Journal. 2009;6(3):29-34. [Persian]. Ardekani ZZ, Kakooei H, Ayattollahi SM, Choobineh A, Seraji GN. Prevalence of mental disorders among shift work hospital nurses in Shiraz, Iran. Pak J Biol Sci. 2008;11(12):1605-1609. doi:10.3923/pjbs.2008.1605.1609 . Kavari SH. A study of depression prevalence in nurses and it’s effect in Shiraz Namazi hospital. Middle East Journal of Family Medicine. 2006;4(3):17-21. Montazeri A, Mousavi SJ, Omidvari S, Tavousi M, Hashemi A, Rostami T. Depression in Iran: a systematic review of the literature (2000-2010). Payesh. 2013;12(6):567-594. [Persian]. Bronder EC, Speight SL, Witherspoon KM, Thomas AJ. John Henryism, Depression, and Perceived Social Support in Black Women. J Black Psychol. 2014;40(2):115-137. doi:10.1177/0095798412474466. Schulz M, Damkroger A, Voltmer E, et al. Work-related behaviour and experience pattern in nurses: impact on physical and mental health. J Psychiatr Ment Health Nurs. 2011;18(5):411-417. doi:10.1111/j.1365-2850.2011.01691.x. McIntyre RS, Liauw S, Taylor VH. Depression in the workforce: the intermediary effect of medical comorbidity. J Affect Disord. 2011;128 Suppl 1:S29-36. doi:10.1016/S0165-0327(11)70006-4. Letvak S, Ruhm CJ, McCoy T. Depression in hospital-employed nurses. Clin Nurse Spec. 2012;26(3):177-182. doi:10.1097/NUR.0b013e3182503ef0. Campbell K, Hanna JC. Individual and Organizational Health and Well-Being. Pensacola, FL: American Association of Occupational Health Nurses; 2014. Najafi Kalyani M, Jamshidi N, Salami J, Pourjam E. Investigation of the Relationship between Psychological Variables and Sleep Quality in Students of Medical Sciences. Depress Res Treat. 2017;2017:7143547. doi:10.1155/2017/7143547.